Transform a Community. Change a Life. Enable More Ministry. By partnering with a national missionary, child or behind-the-scenes missionary, you’re taking on an important role in impacting the lives of people in Asia for eternity. GFA-supported missionaries minister in some of the neediest areas of the world. They’ve dedicated their lives to being the hands and feet of Jesus, and God is using them to shine His marvelous light into people’s lives. GFA’s Bridge of Hope program is helping provide an education for more than 70,000 children, and it’s giving students’ families hope for a brighter future. GFA’s Mission Support Team helps facilitate much of the work being done on the field. Because these behind-the-scenes missionaries serve in the U.S. office, national missionaries and children in Asia are able to receive the support they need. are doing pioneer mission work in villages that need to know God’s love. is providing needy children in Asia with education, medical care and a daily meal; giving them hope for a brighter future. are overcoming gender barriers to impact the lives of downtrodden women in Asia. GFA-supported missionaries are hand-picked and trained to minister the love of Christ in Asia. Thousands of new fellowships have started as a result of their lives. Partnering with a national missionary is one of the most effective ways to share Christ’s hope with remote villages in Asia. They count it a great privilege to lay their lives down for Christ, even if it's to reach the very people who persecute them. They are ready to suffer. Partner with a national missionary and be a part of showing God’s love to a needy village. Families struggling against poverty are often unable to provide a daily meal for the family, let alone send their children to school. Sponsoring a Bridge of Hope child gives a child hope for a brighter future—and impacts the whole family too. 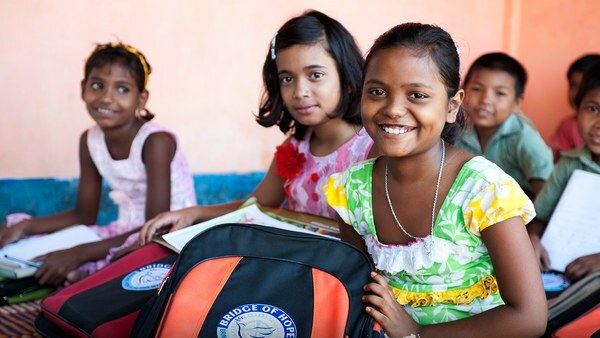 Bridge of Hope is currently helping more than 70,000 needy children in Asia.